(Vancouver) For a second consecutive season, Lions defensive end Cam Wake has been named the CFL’s Most Outstanding Defensive Player. The second-year Lion who notched a CFL-best 23 sacks, 65 defensive tackles, four tackles for a loss and five forced fumbles picked up the honour in Montreal this evening. 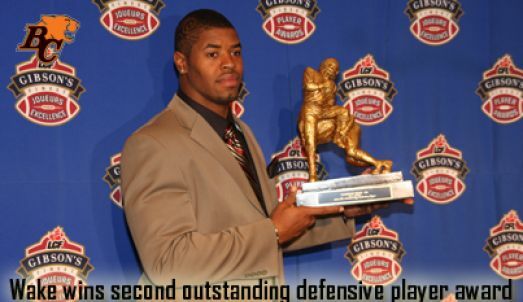 Coming off a 2007 season where he became just the second player in CFL history to win two outstanding player awards in a rookie season, the sophomore spent the 2008 campaign terrorizing offensive opponents even garnering attention as a possible nomination as the West Division’s Outstanding Player.